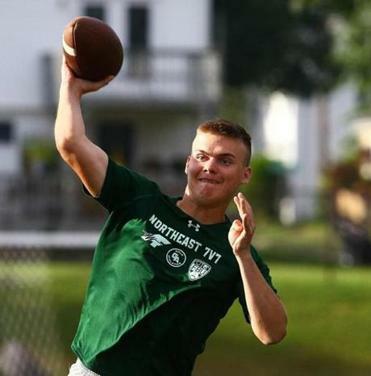 Dennis-Yarmouth&apos;s Jacob McCarthy eyes his receiver in 7-on-7 football at Bishop Fenwick High. 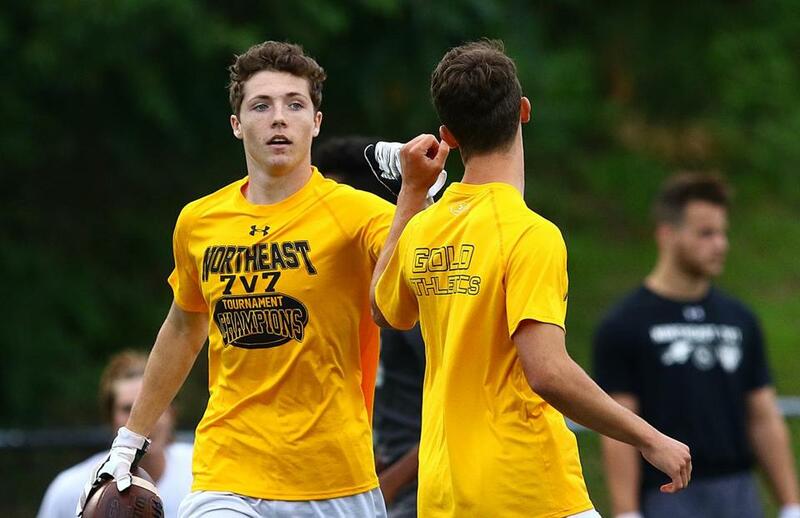 PEABODY — Just more than six weeks prior to the kickoff of high school football season, 10 regional powers met at Bishop Fenwick High on Thursday evening to compete for glory at the UnderArmour New England 7-on-7Championship. The Dennis-Yarmouth Dolphins, a late addition to the field because Bishop Feehan declined an invitation, continued to showcase the South Shore’s football prowess with a 14-13 victory over Middleboro in the tournament final. After edging Middleboro in pool play, 20-14, to make the final four, Dennis-Yarmouth wound up in a tough spot, down 13-8 in the final with four minutes remaining and the ball in Middleboro’s hands. The Dolphins rallied for a stop and rode freshman slot receiver Geoffrey Jamiel down to the goal line before quarterback Jacob McCarthy found senior wide receiver Rob Evans for a winning touchdown on third-and-goal. “The kids didn’t feel any pressure,” said Andrew Jamiel, the son of a D-Y coach and fill-in offensive coordinator during the tournament. 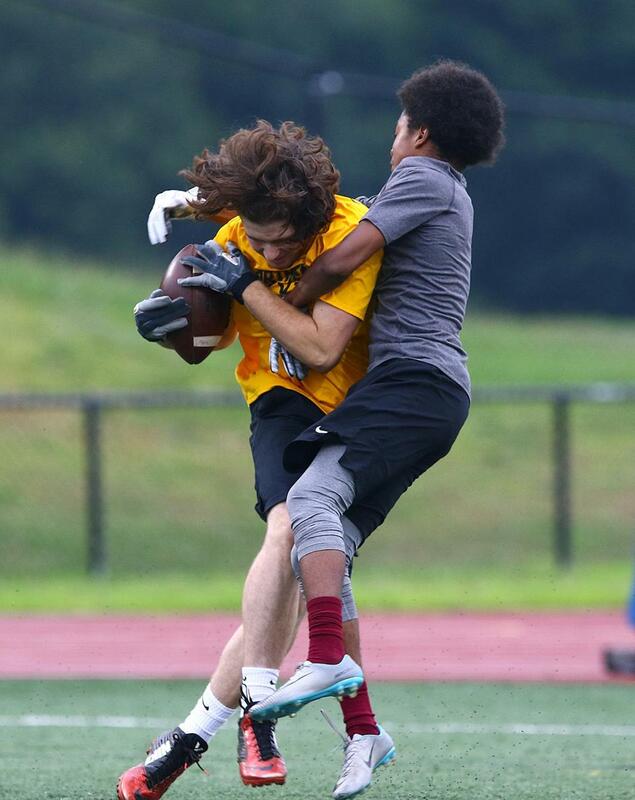 This annual tune-up for passing attacks featured seven MIAA programs, one ISL school in Buckingham Browne & Nichols, as well as out-of-state champions Bonny Eagle (Maine) and Winnacunnet (N.H.). All teams qualified by finishing first or second in regional tournaments, except for the Dolphins, who lost in the semifinals of the South regional. 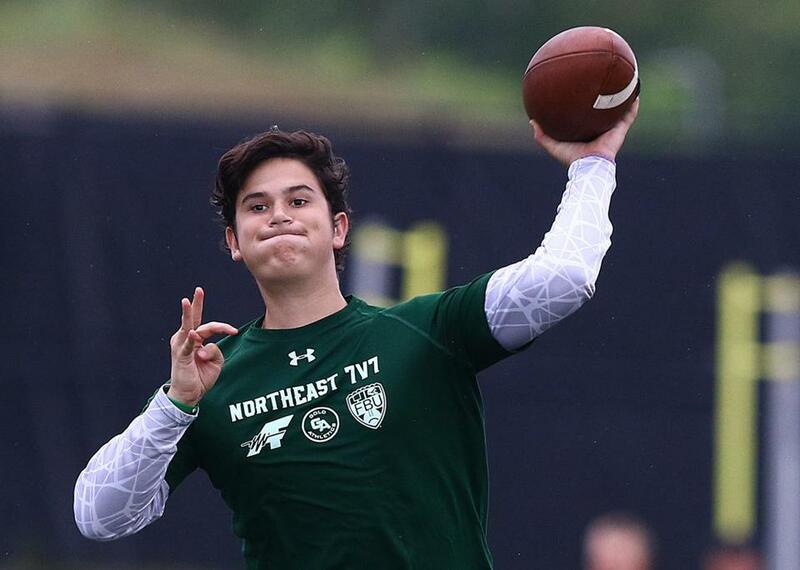 East champion Billerica and South finalist Stoughton both impressed during pool play with quarterback Tom Landry leading the Indians and a pair of impressive receivers carrying the Knights in Ruben Gonzalez and Ajahn Rue. 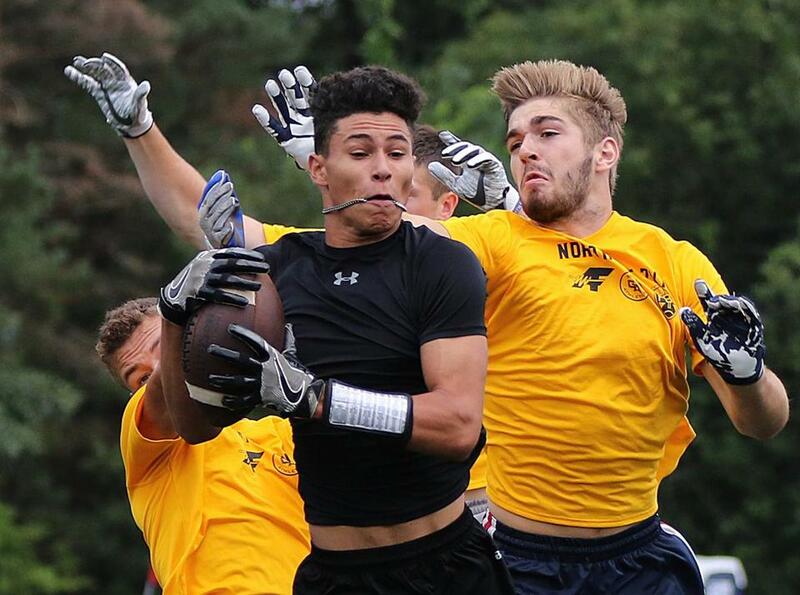 Woburn, Lynn English, and Swampscott each earned wins before bowing out of the tournament. Led by running back Jeremy Soule and quarterback Evan Gwozdz, Middleboro rallied for several close wins to earn the South regional title last week and opened the New England Championship with a double-overtime victory over Winnacunnet. In the semifinals, Middleboro came back to beat BB&N while Dennis-Yarmouth handled Bonny Eagle to set up a rematch in the tournament final, where Evans and company did what they usually do as the dominant program in the Atlantic Coast League. 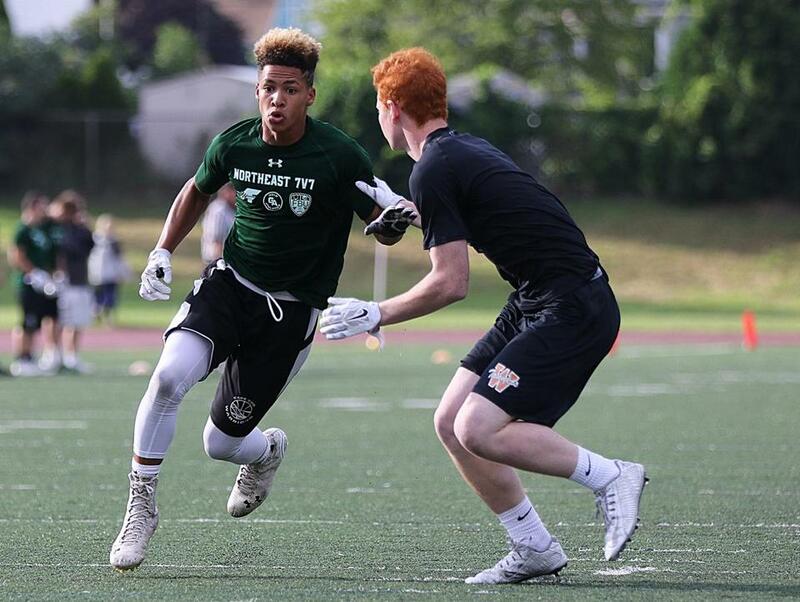 Dennis-Yarmouth's receiver Daryan Thompson cuts upfield during 7-on-7 football. Quarterback Tom Landry led Billerica. Stoughton's Ruben Gonzalez snags this pass from quarterback John Medina. Middleboro's Jack Andrade hauls in this pass from quarterback Evan Gwozdz. Middleboro's Conlin O'Brien celebrates after scoring. Nate Weitzer can be reached at nathaniel.weitzer@globe.com.